This is the perfect recipe for using those wonderful vegetables from your backyard garden or purchased from your local farmer’s market! 1. Heat the oven to 350 degrees F. Cook and drain the noodles as directed on the package using the minimum cook time. 2. Heat the oil in a 10-inch skillet over medium heat. Add the onion, carrots, celery and bell pepper; cover and cook 5 to 8 minutes, stirring occasionally, until the carrots are just tender. Uncover and stir in the zucchini and garlic; cook and stir 1 minute longer. 3. 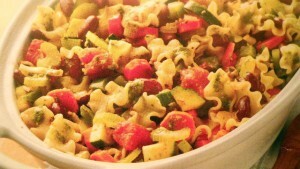 Place the noodles in an ungreased 2-1/2-quart casserole. Stir in the carrot mixture, beans, tomatoes, 1/4 cup of the cheese, the salt, pepper and pesto. Cover and bake for 40 to 50 minutes or until hot in the center. Top each serving with the remaining cheese. Makes 6 servings.